Farmers face a choice between genocide or Zimbabwe-style land grabs. Land ownership is an explosive issue in South Africa. When South Africa ended institutionalized racial segregation in 1994, white farmers owned 85 percent of the nation’s privately held farmland. Over the next 24 years, the government purchased and redistributed more than 5 million acres of farmland. Meanwhile, black South Africans purchased more than 12 million acres on the open market. Last year, the government estimated that white South Africans still owned 72 percent of the nation’s farmland. Since the African National Congress made a promise in 1994 to transfer 30 percent of white-owned land to blacks by 2000, many feel the process of land redistribution is moving too slowly. To speed things up, South African President Cyril Ramaphosa has pledged to abandon the government’s “willing buyer, willing seller” principle in favor of a new policy: The government wants to start confiscating white-owned land without compensation. While a Constitutional Review Committee is still examining the legality of such land seizures, the leader of South Africa’s third-largest political party is predicting violent revolution if white people do not surrender their land. “I’m saying to you, we’ve not called for the killing of white people, at least for now. I can’t guarantee the future,” Julius Malema said in an interview with trt World, published June 9. Speaking to eNCA’s Cathy Mohlahlana on June 14, Malema said he believes South Africa’s poor will rise up against landowners whether or not he has anything to do with it. The World Bank estimates that South Africa is the most unequal nation in the world in terms of income. But Malema is wrong about whites becoming richer while blacks become poorer. Over the past three decades, racial disparities in living standards have narrowed. According to the Economist, whites made up 86 percent of those in the top standard of living bracket in 2004. They made up 49 percent of this bracket in 2015. Total inequality remains wide, while racial inequality is narrowing, because many members of South Africa’s new economic elite are black men like Malema (whose net worth is around $2 million). Malema misconstrues history in a bid to get the over 2 million South Africans who voted for him in 2016 municipal elections to support Zimbabwe-style land grabs. Despite his claims that civil war is coming with or without him, Malema has played a major role in exacerbating racial tensions in South Africa. In 2011, he was tried by South Africa’s Equality Court for singing a song that calls for the shooting of white farmers with machine guns. Five years later, he was tried for encouraging his supporters to illegally occupy white-owned land. A March 2017 AfriForum study noted that farm murders jumped 92 percent the month following Malema’s call to action. Malema dismisses as crybabies those who suggest there is a direct correlation between his remarks and rising farm attacks. But he is notorious for making comments deliberately crafted for plausible deniability. Last March, he told a crowd in Johannesburg that his party was “cutting the throat of whiteness.” Many of his supporters defend his remarks as metaphorical—those who would like to literally slit the throats of white farmers may interpret Malema’s statement differently. An estimated 3,000 farmers have been murdered since 1994. “Africa is for black people. Period. 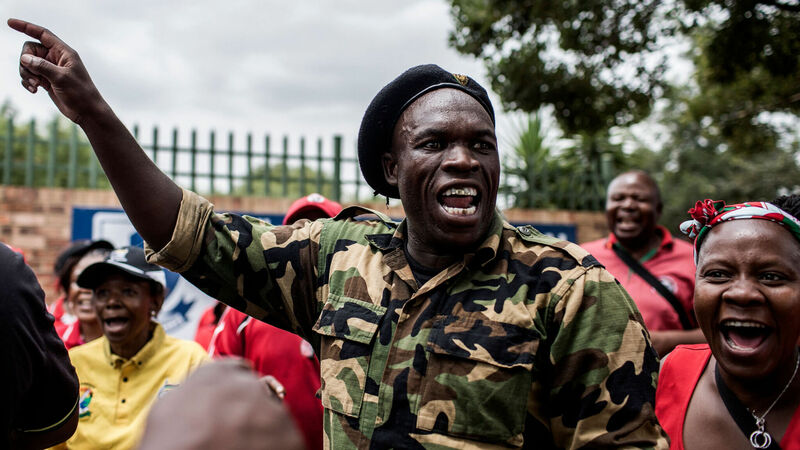 We need our land back and we’re going to take it by force,” one red beret-wearing Malema supporter recently told the bbc. Even if South Africa’s government does not begin confiscating white-owned land like Zimbabwe began doing in 2000, with disastrous results, the inflammatory rhetoric used by politicians like Malema is moving people to violence. According to a paper by Wandile Sihlobo, Theo Boshoff and Sifiso Ntombela, researchers at the Agricultural Business Chamber, there is a real threat that more people will disregard the rule of law and start using violent means to illegally seize land. South Africa is facing a choice between white genocide or the same type of state-asset seizures that ruined Zimbabwe and Venezuela. This rising violence is reminiscent of a sobering prophecy in the Bible: “Make a chain: for the land is full of bloody crimes, and the city is full of violence. Wherefore I will bring the worst of the heathen, and they shall possess their houses …” (Ezekiel 7:23-24). This passage says that so many bloody crimes will occur in the end time that they will be like links in a chain—one following right after another. It even describes the seizure of people’s homes and conflict between ethnic groups. In his book The United States and Britain in Prophecy, Herbert W. Armstrong explained that a time of trouble and tribulation will soon afflict all the descendants of ancient Israel, including British and Dutch South Africans. This time of violence is coming because of the “abominations” or sins of the people (Ezekiel 7:1-3). Of course, this does not mean that the victims of farm attacks are more sinful than the rest of society. Referring to those who suffered deadly fates, like the victims of a tower collapse in Siloam, Jesus Christ said, “[T]hink ye that they were sinners above all men that dwelt in Jerusalem? I tell you, Nay: but, except ye repent, ye shall all likewise perish” (Luke 13:4-5). The 3,000 people killed in farm attacks over the last 24 years were not worse sinners than other South Africans. But God did not intervene to protect them. He is allowing this chain of violence as a warning of even worse violence, unless people cry out in repentance. It is God’s great desire to teach all races and nationalities the way to peace and prosperity. If man would only repent and obey God’s commandments, he would not have to experience such horrific crimes. But the human heart is hard and too proud to admit that it does not know the way to peace, happiness and stability. God must allow people to learn from their own choices until the time when they cry out to Him for instruction. Then He will show them the path to real peace!